Image caption Historic England believes the finds will "advance our understanding of Middle-Saxon religious beliefs"
Archaeologists have discovered 81 "extremely rare" tree-trunk coffins at a "previously unknown" early Christian Anglo-Saxon community's cemetery. Found at Great Ryburgh in Norfolk, their "remarkable preservation" was due to the waterlogged conditions of the river valley. The Historic England excavation was carried out ahead of the construction of a lake and flood defence system. Chief executive Duncan Wilson said the graves were "a significant discovery". 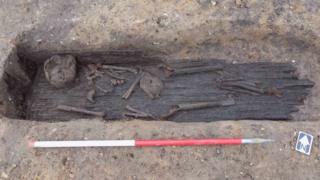 Anglo-Saxon coffins seldom survive because wood decays over time. James Fairclough, the lead archaeologist from the Museum of London Archaeology whose team is based in Northampton, said: "The combination of acidic sand and alkaline water created the perfect conditions for the skeletons and wooden graves to survive, revealing remarkable details of Christian Anglo-Saxon burial practices." Archaeologist Matt Champion made the initial discovery. Landowner Gary Boyce had asked him to put in trial trenches ahead of the planning application for the lake and flood defence system. These revealed high status Anglo-Saxon pottery and Roman Samian Ware. He said it was all the more remarkable because prior to the dig "all the evidence suggested the field had never been developed". They decided to carry out a full excavation in January - and within an hour found the first of over 80 human burials. The dig was completed in June but its findings have only just been released to the press. Historic England said other important finds included six "very rare" plank-lined graves "believed to be the earliest known examples in Britain" and evidence of a timber structure thought to be a church. Image caption Norwich Castle Museum curator Tim Pestell said the find would "refine our knowledge of this fascinating period when Christianity and the church were developing"
Historic England believes the burials date from between the 7th and 9th Centuries AD and were "the final resting place for a community of early Christians". 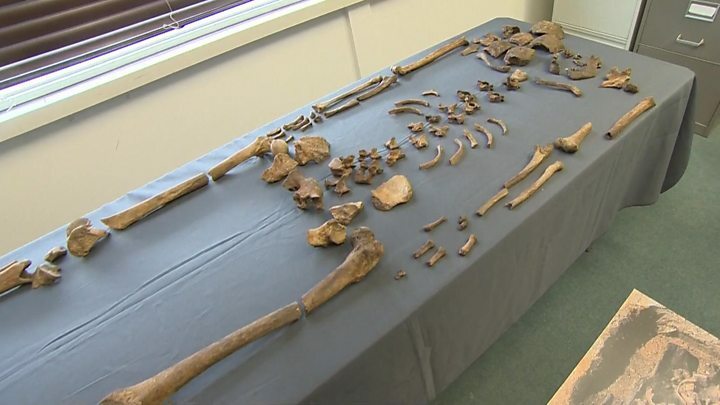 Research is continuing to find out where the bodies came from, how they were related and what their diet and health was like. Some of the finds will go on display at Norwich Castle Museum.